Kidding-season is complete for Spring of 2017! *I may have one adult buck for sale coming soon! He is moonspotted, & blue-eyed! ***THIS is a HERD-REDUCTION SALE*** and are in NO way defective or the duds of my herd. These are my keepers from years of breeding to get the look and quality I desire for my herd. I have kept 7 little does and 2 buckling this year from our explosive kidding season, and simply have to make REALLY hard choices. I will miss them all, and stand behind them 100%. My loss is your gain. This is an opportunity for someone to start a new herd with my carefully-bred, painstakingly-selected, pre-made herd. The Girls in the old days walking the path around the pond! Kidding-season is complete for 2017! NOTE: We do have animals FOR SALE that I have not had time to list yet: Please inquire if interested in any, or all. I can make package deals, and need to reduce the herd due to the number of kids I kept this season. -4 adult bucks for sale! Ready to be your new herd sire! -2 baby bucklings for sale! -6 or 7 adult does for sale! Some in milk! -2 baby doeling for sale! -4 wethers (fixed baby buckling) as pets or companions to other farm animals. ***THIS is a HERD-REDUCTION SALE*** and are in NO way defective or the “duds” of my herd. These are my keepers from years of breeding to get the look and quality I desire for my herd. I have kept 7 little does and 2 buckling this year from our explosive kidding season, and simply have to make REALLY hard choices. I will miss them all, and stand behind them 100%. My loss is your gain. This is an opportunity for someone to start a new herd with my carefully-bred, painstakingly-selected, pre-made herd. *Subscribing allows you to get site updates. Your email address will be kept private.....PINKY SWEAR! To have an excellent herd of animals to show and sell kids from while keeping it small enough to "enjoy" them. We have carefully hand-picked our herd and have a quality base of animals out of a variety of time-honored, reputable farms........ and direct descendants of AGS and ADGA Champions! 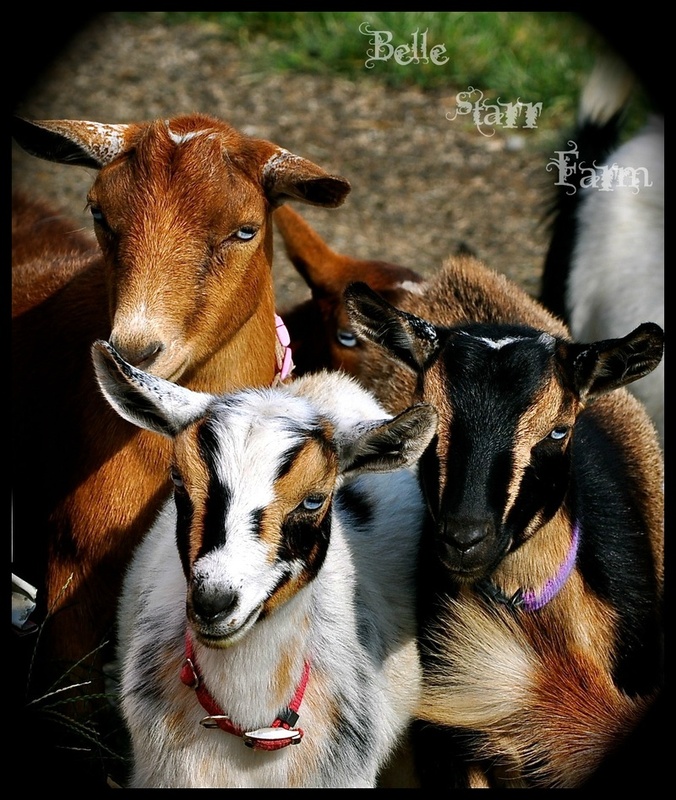 Our goats are raised with the best possible health and growth of each animal in mind. We achieve this through preventive care, proper feeding and grazing, sanitary facilities, and LOTS of LOVE and socialization! We focus on quality not quantity here..... and hope to produce a small number of kids per year whose quality is that of their parents or better. Our registered kids are suitable for Show, Dairy, Breeding and Pet purposes. We will have a small number of unregistered animals per year as well! Whatever your desire, each Belle Starr Farm kid will come to you free of disease, current on vaccinations and deworming, disbudded, and ready to enhance your barn........ and melt your heart! It has been our mission for years to have many animals and provide them with the best home and care that can be given. We love all God's Creatures and started out with cats when we first married in 1993, then dogs & cats, then dogs, cats and 2 Pygmy goats in 2001, leading up to cats, dogs, goats and 2 horses in 2006. 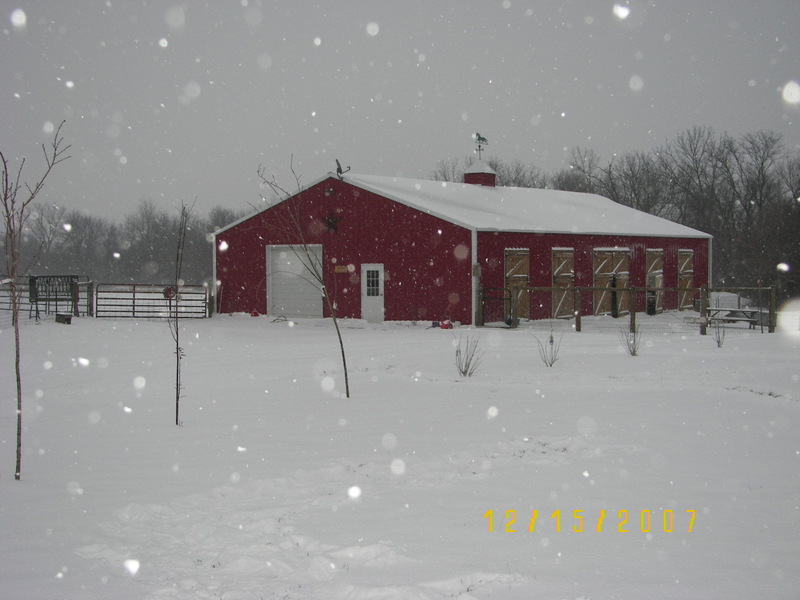 Meanwhile, we had our barn built, and started adding to our Farm which went through a series of name-changes (Triple J Farm, Soaring Eagle Ranch, Lucky Starr Farm...) but eventually became the Belle Starr Farm April, 2008. We added a pregnant Pygmy Goat, my mother's pet dwarf bull (soon after arrival becoming a steer) and a "Lucky" duck. 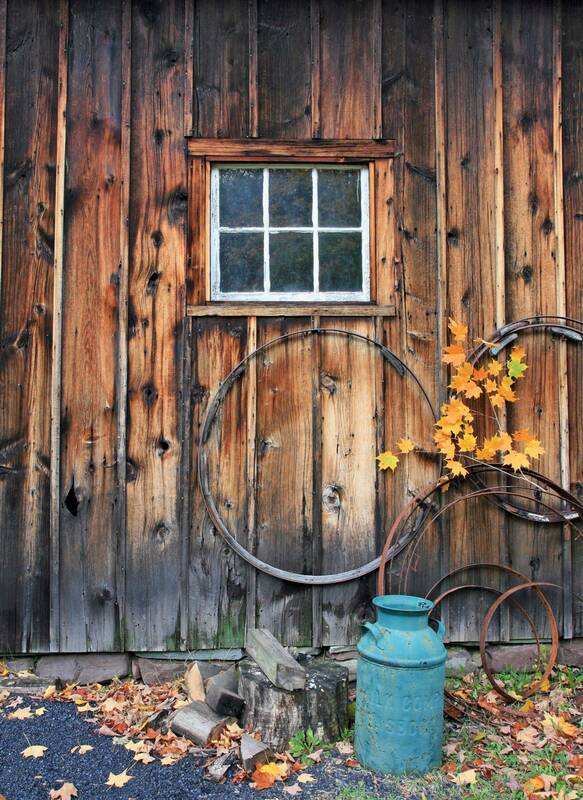 After a rough 8 months in "the wilderness," mostly in the snowiest winter in a long time, we moved into our beautiful farmhouse in February 2007. We then promptly added more ducks, then a llama to protect the ducks, then Guineas and geese, then more horses, Nigerian Dwarf Goats and finally, a Great Pyrenees to protect everyone (the llama wasnt' interested). If we had not gone to look at an unbroke, 2 year old filly in January of 2006.......and fallen in love with her, and if we had not immediately purchased that large, green, buckskin, foxtrotting girl............we would never have moved from our old residence to have a "farm"............but we did............and built our lives and home around her, thus the eventual and final farm name: Belle Starr Farm! We are very proud to share with you all our beautiful animals: We hope you'll get as much enjoyment out of viewing them, as we do out of loving and caring for them!